Recipe, a finalist in the 45th National Chicken Cooking Contest (2003), was created by Lisa Carr of Cedaredge, Colorado. In large saucepan, place water over high heat and bring to a boil. Add chicken, return to boil, cover and remove from heat; let stand about 15 minutes or until chicken is no longer pink. With tongs, lift chicken and immerse in cold water to cool; lift out and drain. Return water in saucepan to a boil, add rice noodles and stir to separate. Return to a boil, cover and remove from heat. Let stand about 3 minutes until noodles are tender; drain, immerse in cold water and drain again. Slice chicken crosswise into 1/4-inch strips. Cut cucumber lengthwise into 1/4-inch slices, then cut lengthwise into sticks. Lay 1 nori sheet on flat surface; arrange 3 slices chicken, end to end, in horizontal line; top with ginger slices. Arrange 1 cucumber stick at edge of lettuce piece and roll tightly. Place lettuce roll on ginger and distribute 1/3 cup rice noodles evenly over lettuce. Fold nori over filling and roll tightly, moistening edge to press and seal. 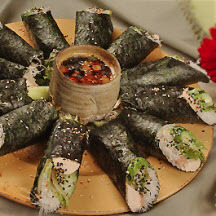 Repeat process and arrange nori rolls, seam side down, on platter. Cut crosswise and sprinkle with sesame seeds. Mix together the soy sauce and wasabi; serve as dip.